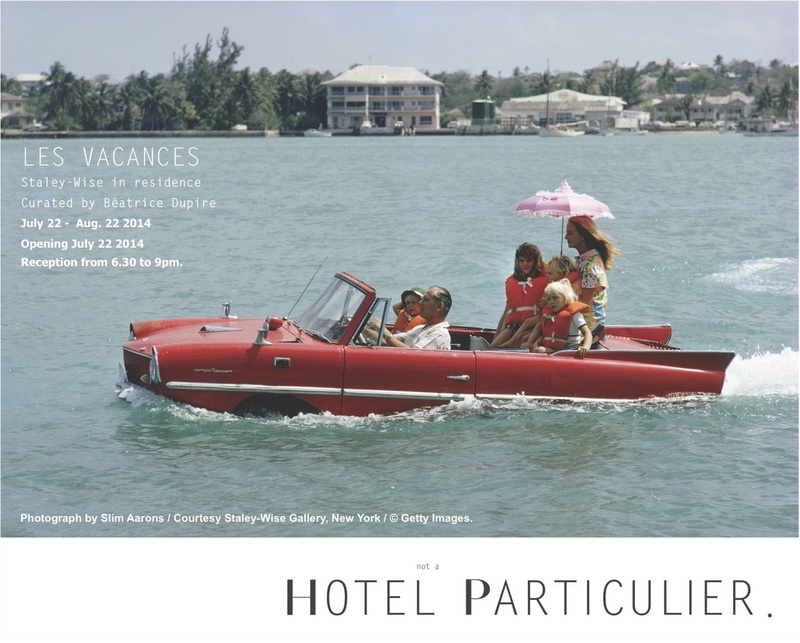 Curator Béatrice Dupire is pleased to welcome iconic gallerists Staley-Wise in residence at Hotel Particulier. with an exhibit entitled Les Vacances, celebrating the free spirit of the summer. The exhibition includes prints by Slim Aarons, David LaChapelle, Ellen Von Unwerth, David Seidner, Arthur Elgort , Michael Dweck, André de Dienes, Sid Avery, Peter Basch, Harry Benson, Denis Piel, Priscilla Rattazzi, Isabella Ginanneschi, Tim Hall, George Holz, and Bruce Laurance. Béatrice Dupire is an International Creative Consultant and Strategist Advisor for a roster of high profile clients in luxury, lifestyle and contemporary art. Founder of the International Festival of Fashion Photography in Paris, she came to New York as the curator of “Yves St Laurent, Forty Years of Creation” exhibition and book. She has since consulted for artist photographers such as Nan Goldin and Roxanne Lowit and collaborated with numerous commercial photographers. She is also the founder and Editor of “Th(e) Influencer” a luxury lifestyle Think Tank distributed by Artbook DAP and recently took residence at Hotel Particulier. Established in 2012, Hotel Particulier. in French contexts, is referred to a townhouse or any other building that spans the public and private, with frequent visitors rather than a place offering accommodation. Located in a former loading dock in Soho Hudson Square, Hotel Particulier. is a curated establishment, with an experiential space for retail, cultural events, and art programming. Hotel Particulier.’s creative bureau provides as well creative content and art consulting with a roaster of artists (emerging and established), experts across different disciplines, and welcomes creatives and specific projects in residence or by membership. Located between Varick and 6th avenue.